When an infection or damage makes its way to the inside of a tooth, the nerve becomes inflamed and starts to die. Fortunately, endodontic therapy (root canal treatment) preserves the tooth so that it doesn’t break down to the point of needing to be removed. Our experienced dentists provide comprehensive root canal treatments right here in our office. An untreated abscessed tooth can cause infection to spread elsewhere in the face, as well as internal resorption or shrinking of the tooth until it breaks apart or falls out. In rare situations, it may even require hospitalisation. 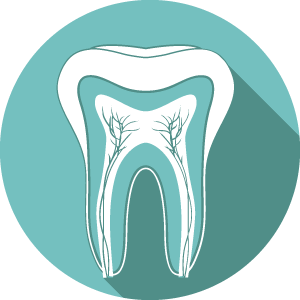 Endodontic therapy involves numbing the tooth and creating an opening to remove the infected nerve. If severe infection is present, we may prescribe an antibiotic leading up to the appointment. After the inner chamber of the tooth is cleaned and medicated, we place a filling material down inside of it and prep the tooth for a crown. As with any other routine treatment, your comfort is paramount to us! We’ve invested in the most advanced materials and rotary equipment to ensure that you can relax while we work as efficiently as possible. In many situations, the procedure is broken up into 2-3 visits to fully complete. Think you may have a cracked or abscessed tooth? Contact us to arrange a brief exam and X-ray. We’re open late!